PNW District Optimist Clubs: Check out those banners! 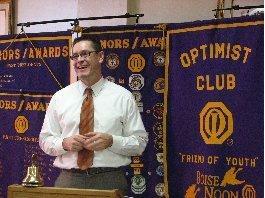 The Boise Noon Optimist Club has been going through some reorganization over the past few months. It's a huge club with over 300 members, but like many clubs, they found that the number of members attending weekly meetings was declining. In an effort to attract more participants, they have adopted an afternoon and evening schedule. Evenings are both business and social - one week is the Board Meeting and one week is pure fun; and the noon meetings are the traditional meeting style that our veteran clubs do so well. The traditional meeting style includes the Pledge of Allegiance, a Toast to Canada and all Nations, and prayer followed by committee reports, socializing, a guest presentation and ending always with the Optimist Creed. The guest presenter may be someone from inside or outside the club, but should always appeal to current events, interests, or activities of the community they serve. Presenters connect the Optimist Club to the community and they have the opportunity to find out all about the Optimist Club while they are there. I found the pictures included here in the most recent update from bulletin editor Walt Callahan and I wanted to share them with you. The guest presenter is Dan McQuestran, a club member and economist making stock market predictions for 2011. He says, "In 2011 there will be an 11% to 18% raise in the stock market. There will be gridlock in congress, but stocks don't reflect what is happening in politics. California and Florida will be in default. Bonds will go down. House will remain in trouble. Commodity stocks will do well." I don't know about the advice - any advice is scary in this economy - but aren't the pictures, with the Optimist Club banners behind him, great? 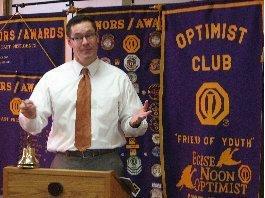 Does your Optimist Club follow a traditional meeting model? Please tell us in the comment section and send us a picture so we can share your banners with the world.